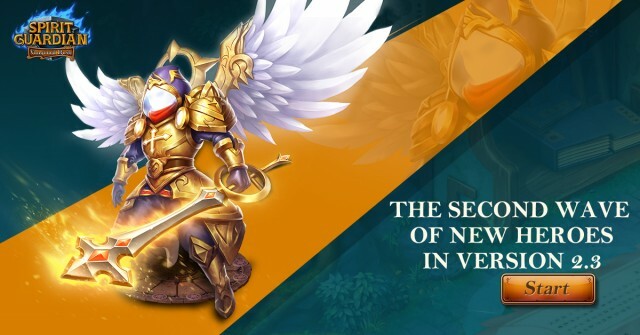 While there are many free hero online RPG’s out on mobile, Spirit Guardian - Vanguard Rush is known for its huge cast of characters from all over the world, the upcoming Update 2.3 which added even more heroes. Legendary heroes of Western and Eastern origin, pop-culture icons, and high fantasy archetypes have all been gathered to do epic battle in this free to play real-time strategy RPG. Last time, the Spirit Guardian Team introduced the first wave of new heroes in Version 2.3. This time, the second wave of the powerful new heroes join the cast of this epic mobile RPG game. Warlord Cao deals 300% ATK DMA to all enemies that prevents healing for 5s, this attack’s CRIT rate is increased by 70%. Increase CRIT, DMA and ATK SPD by 15%, lasts 10s. Stacks up to 5 times. Warlord Defier-Warlord Cao fires a ricochet shot that damages multiple enemies and poisons them. Dream-Assassin-Warlord Cao attacks the enemy with the highest ATK, dealing damage and reducing target’s ATK. Also adds a shield on himself equal. Electra unleashes an iron sand attack in an area around her target, dealing 280%ATK DMA to targets in range; targets are pulled in and pushed out of the center; after 1.5s a thunderbolt strikes the center in a small area, dealing 150% DMG and stunning for 1s. Magnetism-Electra uses magnetism to reflect a percentage of damage back at attackers while reducing damage taken and has a chance to gain immunity to silence. Railgun-Every time Electra attacks, she shocks enemies in a frontal rectangular area, and adds paralyze effect that stacks up to 8 times. Depha blinks to enemy with the highest ATK and deal 400% ATK DMG, locking the target and preventing rage gain for 2s. Also increases her DMA and CRIT for 8s. Depha also summons a Materia that can’t move and only takes 1 damage from attacks, material continuously deducts 4 rage from nearby enemies, reduces damage of ally heroes by 50%, and gives a shield to random allies. Shadow Kick-Depha kicks enemies in a cone area, this attack has 35%lifesteal effect and silences targets. Flash Combo-Depha attacks her current target 8 times, each attack deals additional damage equal to 2% of her max HP, target can’t gain range for 2s.